To purchase CoCam Infrared Filters contact us. 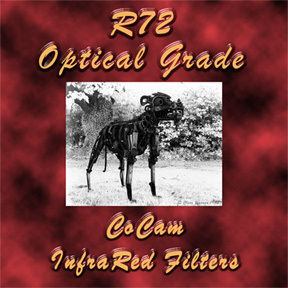 The CoCam Infrared filters are of the highest professional quality. The filters go through a six stage quality control process and are rejected if they fail on any stage. The filters are manufactured for CoCam by the company that invented CR39 Resin Filter Technology. The company make professional photographic and motion picture filters. These Infrared filters will open up a new photographic world, producing stunning images with an ethereal look lit by light which our eyes do not normally see. The CoCam Infrared filters have examples of photographs taken and printed by Clive Warren on the front of the packet to show the possible effects from the filter. There are currently four different types of Infrared filters available. These are the Wratten 25, Wratten 89B (R72), the Wratten 87 and Wratten 87C rated InfraRed filters, all made with the same CR39 optical resin materials. All of these filters except the Wratten 25 are opaque - ie you cannot see through them. The Wratten 25 and 89B (R72) filters are probably the most useful as they can be used with all Infrared films eg Kodak HIE, Konica 750, Ilford SFX200 and Agfapan APX 200S. The 87 and 87C filters are more suited for use with Kodak HIE. The 89B (R72) is probably the best choice as it gives a true infrared effect. The Wratten 25 filter is a red filter which can also be used for other normal black and white photography and darkens blue skies. The filters can also be used with Sony camcorders - most camcorders are in fact sensitive to Infrared light however some of the newer Sony camcorders allow the user to switch to a "HiLux" mode which removes a filter internally which normally stops most IR light. These camcorders can be excellent devices for previsualising a photograph. The Infrared button on the menu bar above leads to an Infrared FAQ which should answer most questions you may have about infrared photography. An infrared glossary will also be provided in the near future. Modern camera filters use a polyester substrate called CR39 and the colour is dyed onto the surface. The CoCam Infrared filters are manufactured using a process which colours liquid resin (dying in the mass) before it is then cast. In this way, filters can be made much more accurately. The CoCam filters are made from lens quality optical resin. Unlike gelatine and polyester filters, the CoCam filters can be cleaned with hot soapy water and mild solvents. Size - Cokin "P" fitting 85mmx85mm These are a snug fit in a Cokin P holder. As you cannot see through the Infrared filter, simply raise the filter in the holder to compose through the viewfinder and lower to take the photograph. Alternatively you can simply hold the filter in front of the lens - making sure that you keep your fingers out of shot :-) If you use a rangefinder camera rather than an SLR then the filter can be left on the lens as it will not affect the viewfinder. You can also use the filter over a camera flash unit or over a flashlight to take InfraRed photographs at night or to use with a camcorder to give night vision. There will be no visible light other than the faintest red glow with high power light units. I can supply plastic P-size filter holders new if required, or a more expensive pro. range of anodised aircraft aluminium filter holders and hoods made by the filter manufacturers. These are listed in Accessories under the Equipment section from the menu bar above. Here are a few Infrared photographs I have taken with an R72 CoCam Infrared filter that is in my camera bag. Click on the images to load larger versions.